The perfect yard starts with the perfect plan. Let’s think about this for a second. No one wants to have an ugly or inadequate landscape. It makes your home, your most valued possession, look bad; it certainly won’t help you with home value and forget about curb appeal! So, let’s go back to that first statement again – the perfect yard starts with the perfect plan! Completing a landscaping project can be overwhelming without doubt, especially doing it by yourself. Where to start? What to do first? Who to call? These are the most common questions nursery pros get in the landscape industry. We’ll break these down for you and get you started on that perfect yard. The first thing you should do to get started with your perfect yard is to take some photos and general measurements of the area you are needing to have landscaped. If this is the backyard, front yard, side yard, around a patio or a pool, or anywhere else, you need to have a starting point for the plans; measurements and photos are crucial for this. Once you have done some homework, now it is time to contact a nursery pro. Using a reputable nursery pro like those found at Moon Valley Nurseries is a great place to start. All our nursery pros have gone through extensive training to be able to provide our customers with the best service and trees available. Using a nursery pro that understands proper placement and who works with you to accomplish your goals is the first step to success. The next step is to start thinking of what you want the finished product to look like and, more importantly, how you want your landscape to function. Are you trying to create privacy from a nosey neighbor, creating a tropical backyard for resort-style staycations, do you need to reduce the cooling cost of your home in the summer, or are you just trying to add some pop and curb appeal? Once this is figured out, speak with your nursery pro and they will begin to get your dreams working into a reality. Nursery pros at Moon Valley Nurseries are trained experts in design and are extremely capable of taking your landscape to the next level. They will help with choosing the perfect trees and shrubs for your landscape and putting the correct tree in the correct space. Once your nursery pro has gotten everything figured out for you with creating a design and selected the perfect trees for their new homes in your landscape, the next step is to schedule a time to have expert planters come out and install everything perfectly. 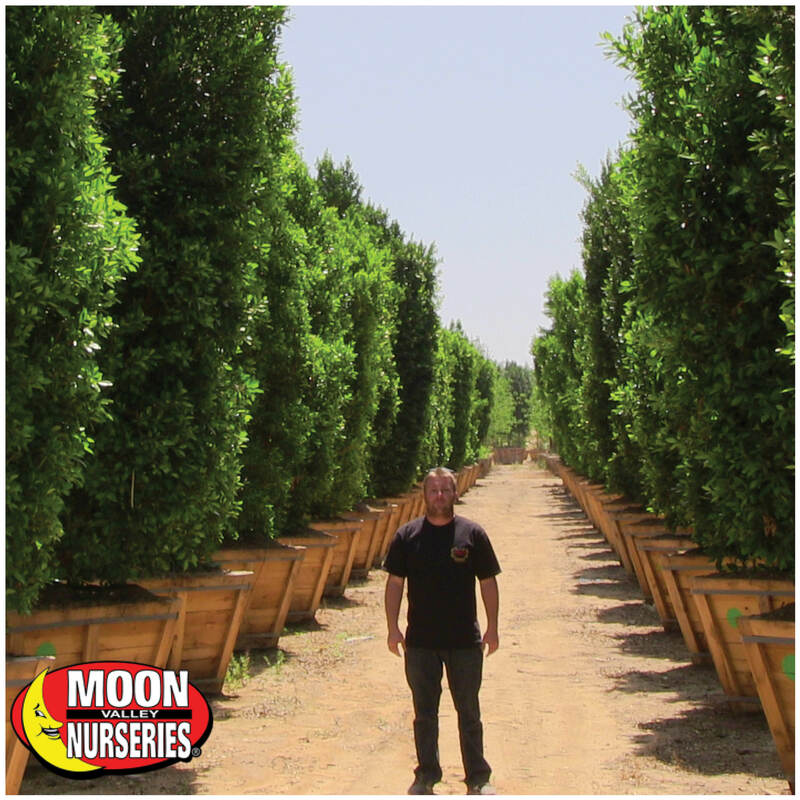 Our expertly trained staff of nursery pros and installation experts will give you the exclusive Moon Valley Nurseries VIP experience. From the moment you step into the store or make that first call, you’ll notice the Moon Valley Difference. Landscaping in August may seem challenging. After all, going outside can feel like you’ve just stepped inside an oven. However, this is a great time to enjoy your trees and plants that attract birds and butterflies to your yard. After all, they don’t seem to mind the heat! How about your trees and plants? The extreme Arizona heat can be tough on some of our landscape material. There is some good news on the horizon. Yes, cooler days will be here before we know it! However, until those better weather days arrive, we still need to pay close attention to our landscape. 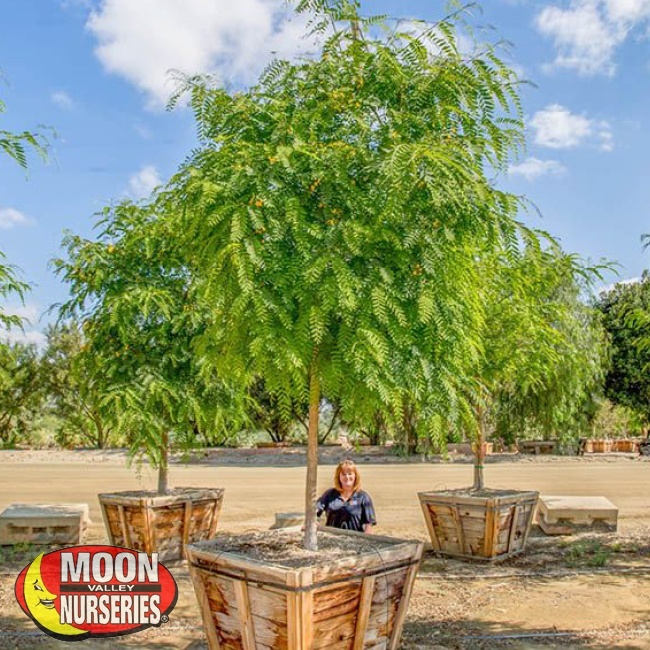 Moon Valley Nurseries is a local Phoenix tree nursery that has been around for over 20 years, so we know how to handle the heat better. 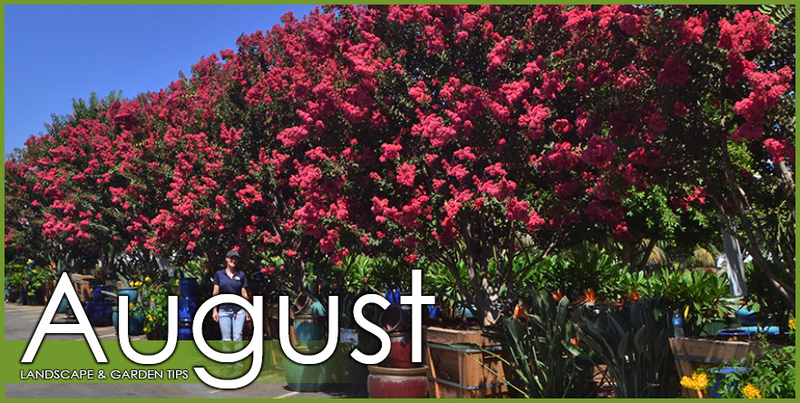 Our nursery pros live and work here, too, and have the perfect tips and suggestions for a healthy landscape during the grueling month of August. Read our tips, and most importantly, hang in there! Trunk Protection: With so much sunlight in the summer, getting sunburnt is more prevalent this time of the year. We can prevent sunburn by applying sunscreen on our bodies, and recover with some Aloe Vera. What about the trees in our landscape? Young trees, particularly citrus, need some protection. We can provide protection and prevent sunburn to our trees with a Protective Tree Wrap. We also recommend staking any age tree to provide stability when the high winds arrive. Fertilize: The material in our landscape is dealing with the stressors of August. All those higher temperatures are causing the trees and shrubs in our landscape to show stress. Moon Juice can help with the heat stress, and when applying it, can also prime the roots for fall feeding. Lawn Care: This is the right time to raise the mowing height to 2.5 to 3-inches. For our Bermuda lawns, we will want to water 1-inch per week. We can also give our lawns a boost with our fast-acting Moon Royale turf fertilizer. For our palms showing stress, we will want to apply our Super Palm Juice. Mulch: Make sure to check the mulch around your plants. If you notice there is little or no mulch, be sure to put in a 3 to 4-inch layer, which can conserve moisture. Mulch any area that is receiving direct sunlight on the dirt. Mulching allows the roots to keep moist and cool. Garden: This is the time to start your fall vegetable garden. Plant vegetables such as broccoli, Brussels sprouts, Chinese cabbage, carrots, collards, lettuce, and other cool-season vegetables. We will also want to remove any old vegetable plants that have stopped producing; doing this will help to eliminate pests and diseases from your garden. Make sure to stay on top of weeds, remove them, and do not let them go to seed. We can plant trees that can liven up our Arizona landscape. Besides beautifying our yards, these trees can also provide lots of shade that can bring some relief during these long and hot, sun-filled days! 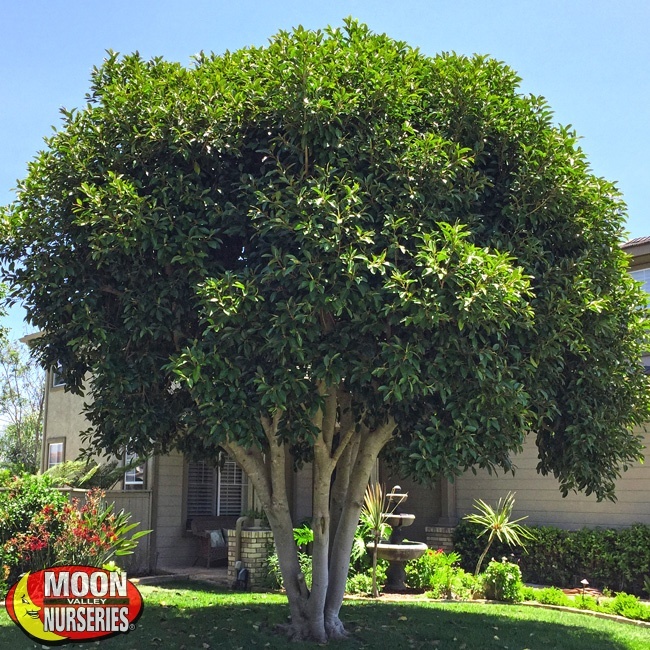 Indian Laurel (Ficus): It’s summertime, and Indian Laurel trees can come to the rescue in more ways than one. This Ficus tree is valued by many for its capability to provide shade. These evergreen trees thrive in a location with plenty of full sun exposure. People throughout Phoenix appreciate the wide-spreading canopy and lush green foliage that adds color and plenty of shade to landscapes. Buy a few mature specimens and have them properly placed around your home so that they can help reduce the temperatures inside your home. Do you want to make your yard much more private? Our Indian Laurel Columns are ideal evergreens for creating privacy. Line them up along a fence line and get ready to enjoy a yard without nosy neighbors getting into your business. And, those with homes near busy streets are sure to appreciate the way that these trees create a natural sound barrier. These beauties can handle the summer heat, too! Tipu (Tipuana tipu): If you are looking for one of the best shade trees you can find, look no further than the Tipu tree. These are colorful flowering trees, and mature specimens can provide lots of shade. These tropical-looking trees grow fast, feature feathery, bright bluish-green foliage, and have a high canopy that offers a beautiful resting spot to escape the sun. They also put on a show when the golden blooms arrive, covering the tree in vibrant hues that transform the look of any environment. 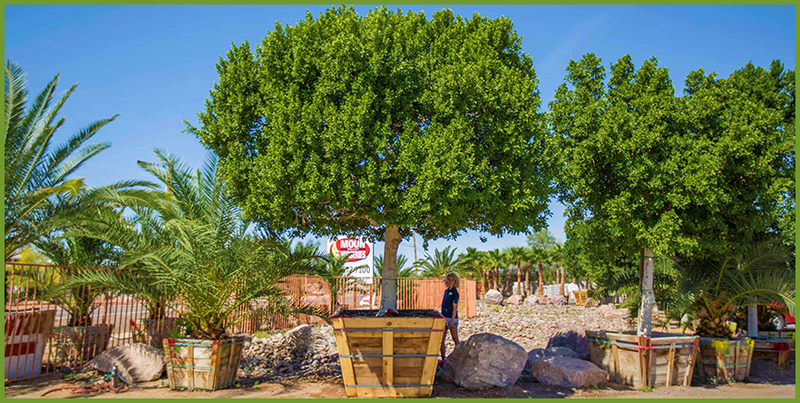 These are ideal trees for our environment as they thrive in intense desert heat. We can plant Tipuana tipu trees as street trees, near the patio, and in any place where a beautiful shade tree is desired! 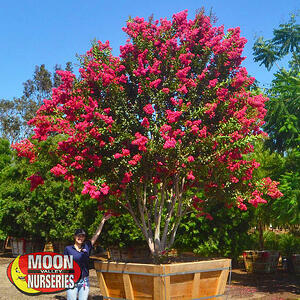 Crape Myrtle (Lagerstroemia): Bring a splash of vibrant color to your landscape – plant Crape Myrtle trees! 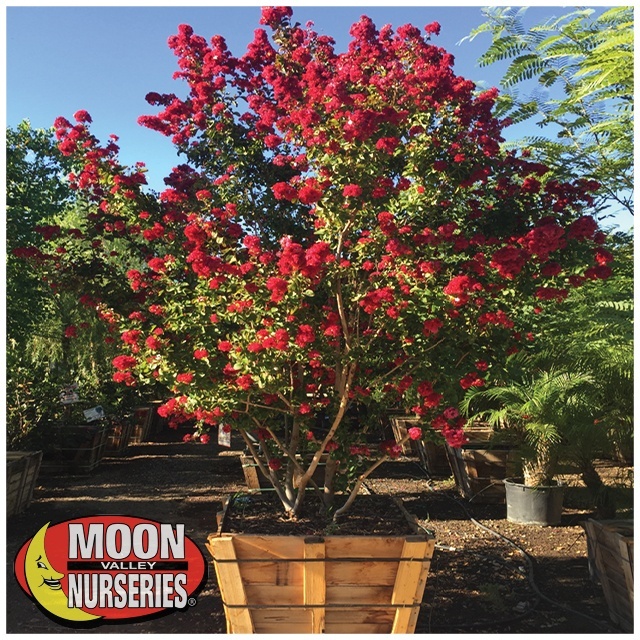 We custom-grow the best-quality Lagerstroemia trees with flower colors that range from dark purple, dark pink, white, and red! They bloom from late spring through the summer, creating a happier landscape that can help us during the summer. They please the eyes year-round thanks to its attractive bark and fall color. These stylish, smaller trees are the perfect size for any landscape. Crape Myrtle trees love fun sun exposure, and they are drought-tolerant once established. 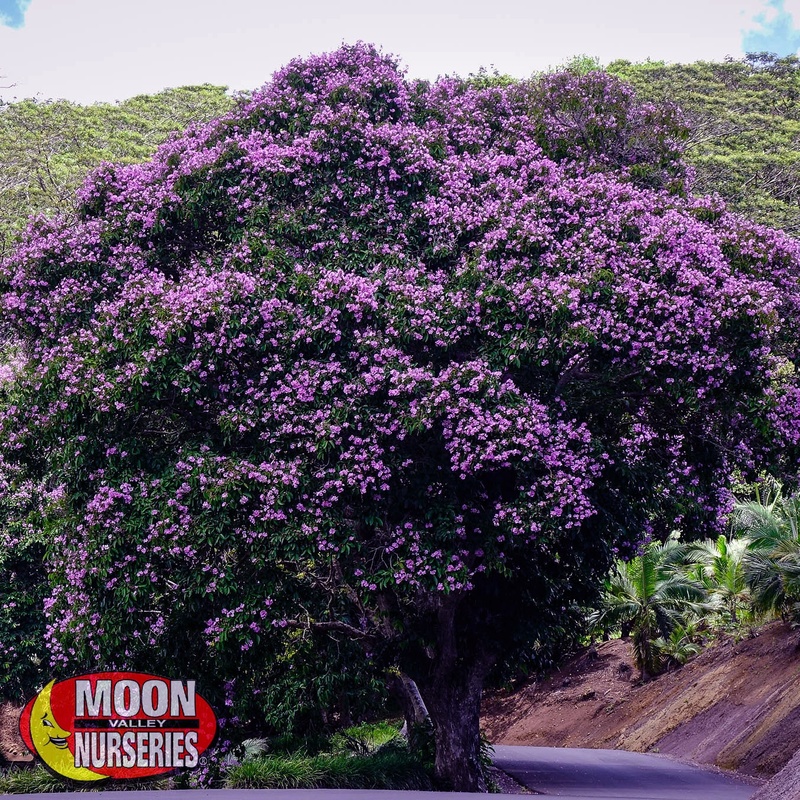 We are the grower that only grows the best Lagerstroemia for our area – ours are mildew resistant varieties! 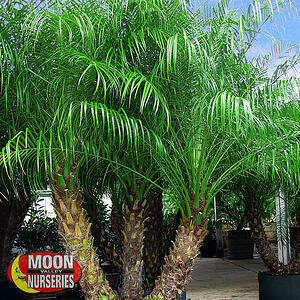 Piru Queen Palm (Syagrus romanzoffiana): Every backyard oasis needs a Piru Queen Palm. Our Queen Palm is used to create a tropical paradise, complete with shade! These palms are heat tolerant and feature dark green palm fronds that add a calming vibe to any environment. These are low-maintenance trees that can fit into any landscape style. They are also prized for having a look that complements all types of architectural homes and buildings. Add curb appeal by planting them in the front yard. Our Piru Queen Palms are grown from superior seedlings with better genetic traits, so you get the hardiest palm you will find. Vitex (Vitex agnus-castus): Summertime is the right time for Vitex. Get ready for the butterflies. During the summer months, it puts on a show as the purple blooms arrive at every growth tip. This purple delight is the perfect size for any landscape. It features turning, twisting trunks and a statuesque appearance that makes it an excellent choice to light up with nighttime landscape lighting. In addition to its bright flowers are its long, dark grayish-green leaves that make them a favorite for yards in Arizona. We like to plant them as a single lawn specimen, in rows along a border or driveway, and as a small patio tree. Easy to grow and maintain. Plus, it is very drought-tolerant once established. Allow the Moon Valley Nurseries planting crew to do all the work! We offer free planting on mature specimen trees and larger so that it cannot be any easier to have the yard you have always wanted, no matter what season we are in. 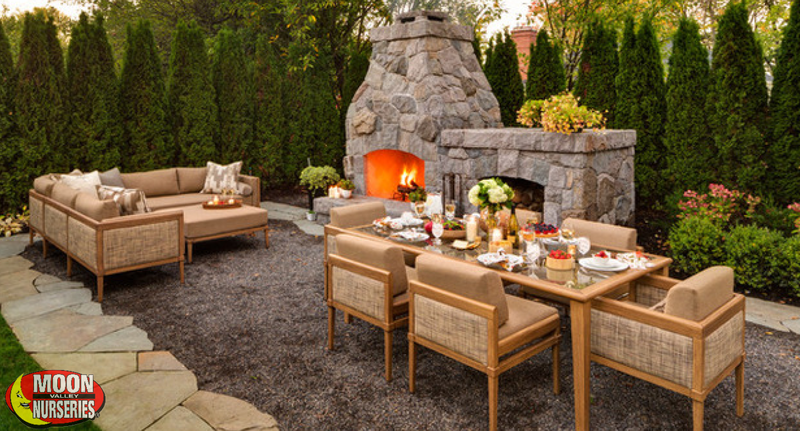 You can sense it when it feels like you’re on display in your personal outdoor space. It’s a feeling that can make it a little harder to relax and enjoy your front yard. With the right evergreens, you can create a fortress that feels peaceful, and most of all, private. Planting for privacy is a breeze with evergreen trees. Using trees to create privacy in your front yard means that you can add color, texture, form, and you can incorporate them into your landscape’s design. It’s a natural privacy solution that provides plenty of peaceful solitude. Yes, you could install an expensive fence or build a wall made from brick, stone, or some other solid material. The thing is, those tall fences and walls can make us feel confined in our space. Not to mention that there could be restrictions based on height, placement, and style. Plus, many man-made fences and walls can become an unsightly eyesore over time. Instead of, or in addition to, fences or walls, they can create a natural yard boundary. They can block viewpoints from neighbors or street traffic and unwanted views. They can create a natural windbreak to protect your property from high winds. Can create a natural sound barrier – ideal for properties near busy streets. Enhances the architectural design of your landscape design. Evergreen trees hold onto their leaves all year long so that their foliage can add wall-to-wall privacy year-round. As they mature, evergreens create a consistent look that makes them an ideal privacy screen. They do much more than create a private yard. Evergreen trees help absorb ambient noise, too. Privacy never looked so good! 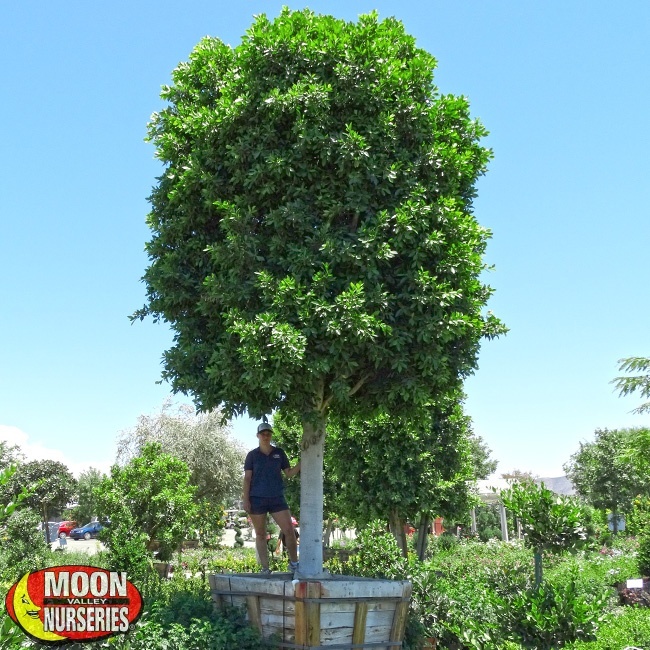 Here are five of the best front yard landscape trees for front yards in Arizona – all available at your nearest Moon Valley Nurseries location. Indian Laurel (Ficus nitida): One of the best evergreens you can find is also one of the best trees for making a privacy hedge. Yes, our Indian Laurel Columns are a favorite throughout Arizona. We use them to block out unwanted views, road noise, and create a private front yard. They are super green, so we like to plant them along a fence where they create instant privacy with a lush green background. These evergreens are water-wise trees that love the heat and thrive in our desert environment. 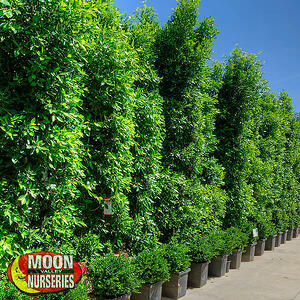 There is no doubt that Indian Laurel Columns are perfect for creating a living wall. They are also ideal for providing shade. Ask us about how proper placement around the home can create privacy and help lower your utility bill. 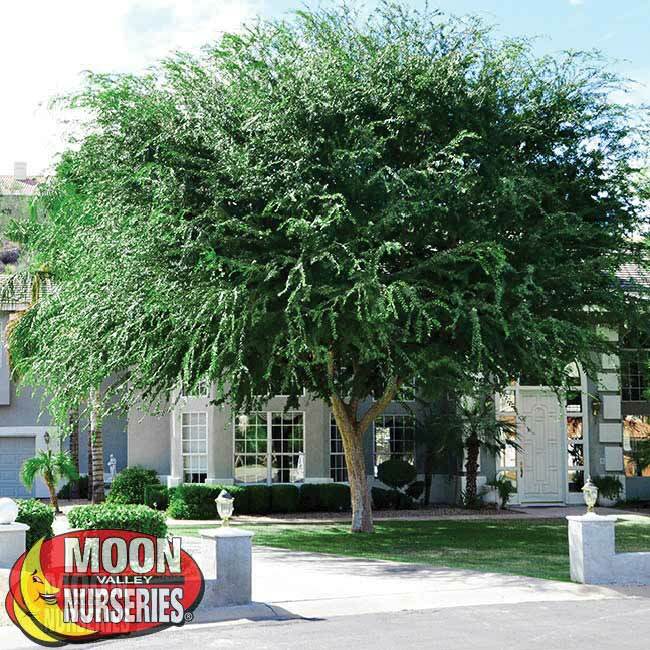 Carolina Cherry (Prunus caroliniana): These evergreen trees love the heat and thrive with full sun exposure, so they are perfect for yards in Arizona. 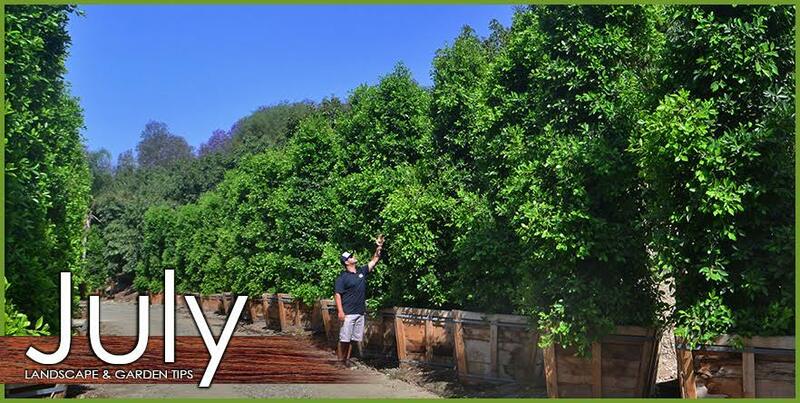 We offer the ‘Compacta’ strain, which is more densely branched and easily tamed so that it is an ideal tree for creating a living privacy screen. Its dark green foliage forms a lush background. Many people feel that its bright green foliage has a scent reminiscent of maraschino cherries. Plus, beautiful white flowers bloom in spring, with a fragrance that is pleasing to the senses. Plant them along a border as a solid privacy barrier that is also a superb windbreak. 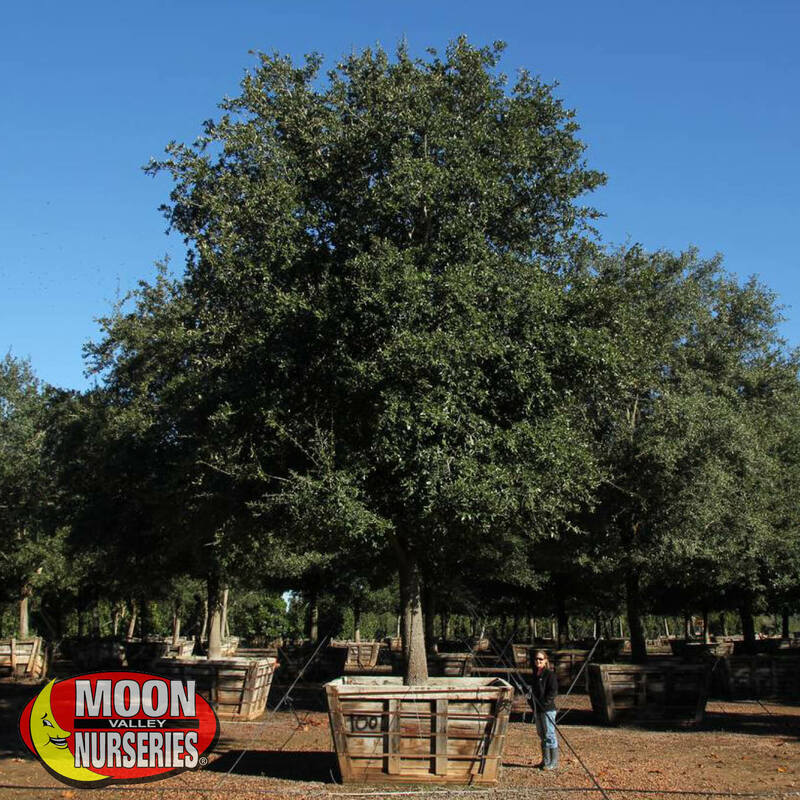 Live Oak (Quercus virginiana): Live Oak is another of our beautiful evergreen trees to consider for privacy. These are long-lived trees with dense, gray/green foliage that can block unwanted views. Besides creating privacy, these evergreens feature a wide-spreading crown that can provide lots of shade. These trees are also noted for being very drought tolerant once established, and for the minimal care required to keep their good looks intact. Plant one in your front yard and let your children explore the sturdy limbs without nosy neighbors getting into your business. 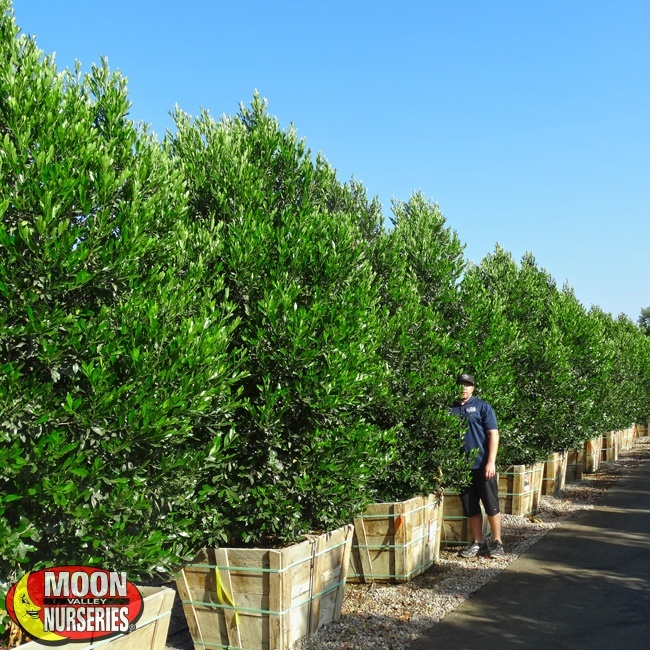 Olive Tree (Olive europaea): Fruitless olive trees are ideal evergreens for Arizona landscaping projects, especially if the job is to create privacy. These trees have been cultivated for over 6,000 years and can bring the look of the Mediterranean to your home. We like to plant them in rows along a fence to create a beautiful living wall. Their gray-green and silver colored foliage is visually exciting and can provide shade, too. You can create drama highlighting their multi-trunk structure with landscape lighting. 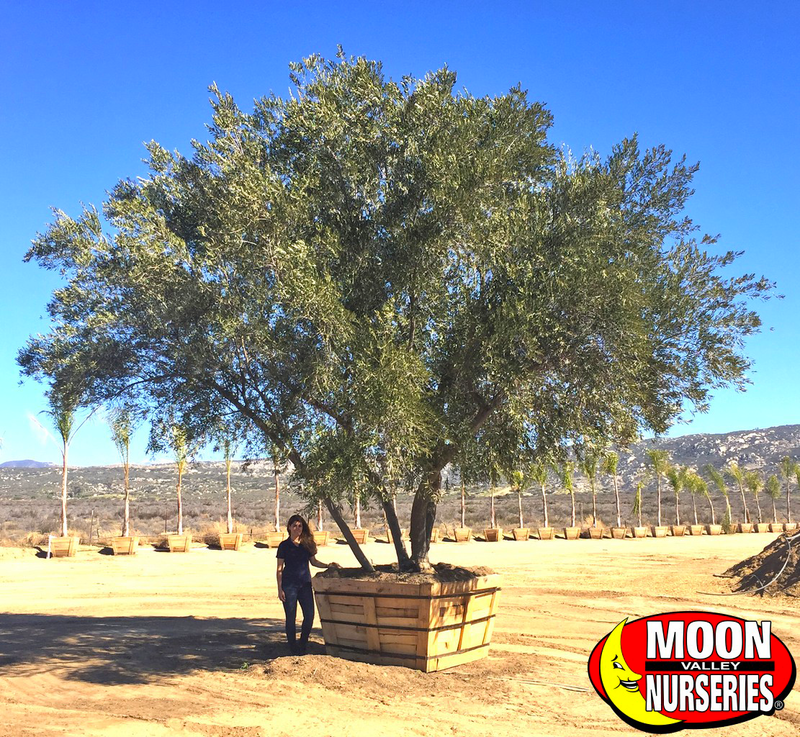 At Moon Valley Nurseries, we only grow guaranteed disease-free olive trees. Oleander (Nerium oleander): Plant Oleander in your front yard and create a beautiful privacy hedge. This evergreen can make your yard feel cozy and look beautiful! Its dense, upright growth habit makes it an excellent screening plant. Plant them as a tidy hedge or privacy wall. Its narrow leaves are dark green, leathery, and semi-glossy. From late spring to fall, it blooms fragrant flowers, clustered at the twig or branch ends. The flowers range in color from pink to red, white and salmon, so they are a colorful addition to any yard in Arizona. Plant them along property lines, lining walkways, or driveways. Oleander creates a private front yard no matter where you choose to plant them. We Do the Work – Come Home to a Private and Beautiful New Yard! It’s hot outside, let our Moon Valley Nurseries planting crew do all the work! 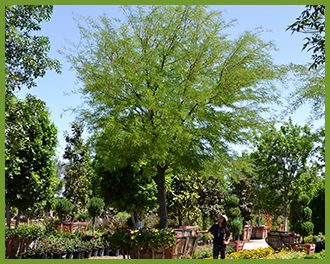 Speak with our nursery pros and allow us to help you select the perfect evergreens to make your yard private. Plus, many of the evergreen trees and plants we grow can provide lots of shade, too. We have what you need to create a natural privacy solution, whether you have a big or small yard. Relax on your front porch and enjoy the sight of your children playing in a private yard. Plant evergreen trees for privacy and spend more quality time in your front yard. The lush, tropical appearance and majestic silhouette of palms can bring lots of interest, beauty, shade and much more to our Arizona landscape. 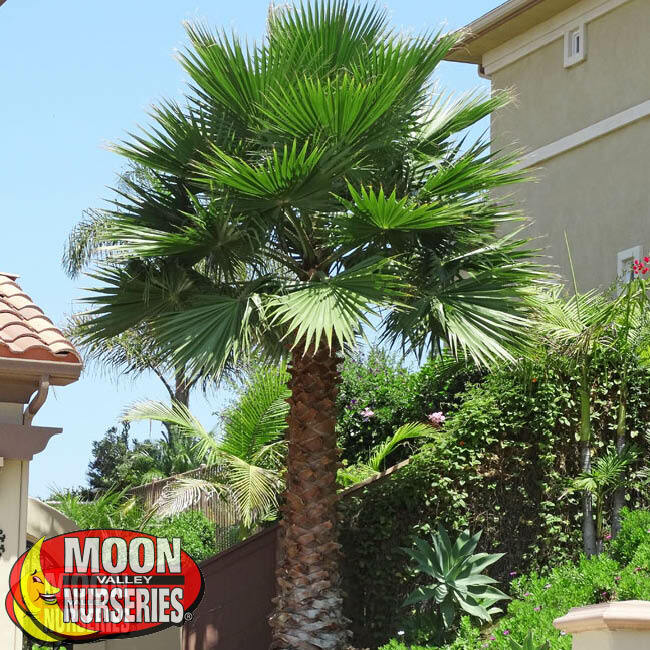 We can plant some of the best-looking palms in our area, such as the smaller-sized Mediterranean Fan Palm, the elegant Date Palm, and an Arizona favorite, the Piru Queen Palm, to name just a few. Since the weather is sweltering in the summer, we are going to water our palms more than usual. Besides watering, feeding them with the proper fertilizer is beneficial, too. And, when it comes to pruning and trimming, you can do this all year. However, for best results, hire a professional. Watering: When the temperatures reach above 100 degrees, deep water about 4 to 5 times a week. Keep in mind that tight clay soils that don’t drain may require one less time per week. Loose, sandy soils may need a bit more water per week. A great way to check the soil is to scrape the surface at least six inches deep with a little shovel. If the soil feels dry, it is time to water some more. We recommend drip watering or using a soaker hose with a very slow trickle so that the soil can absorb the water. Let the soil dry out thoroughly, then repeat the process. Fertilizer: Keeping palms healthy-looking can be a breeze with the proper fertilizers. 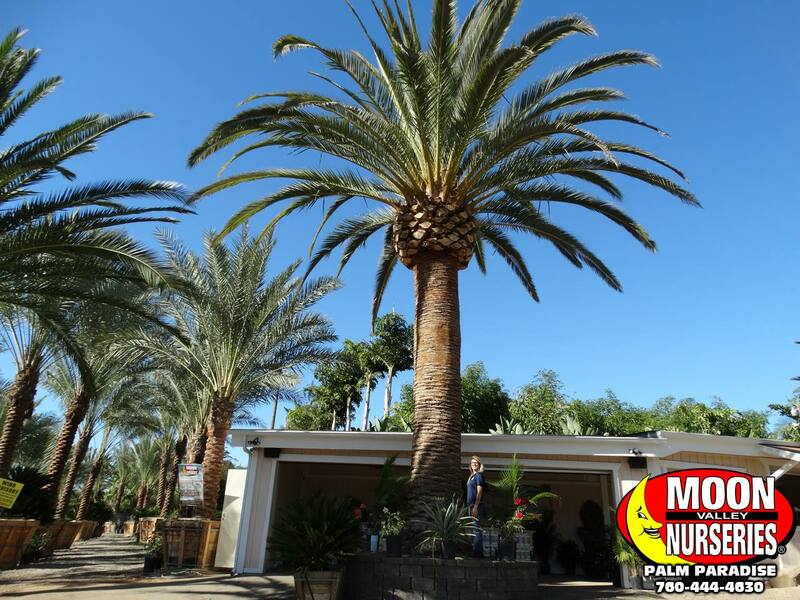 Moon Valley Nurseries has taken the guesswork out with our all-purpose fertilizers with the essential micro and macro-nutrients every palm tree needs to thrive in our desert environment. Our fertilizers are very easy to apply! Super Palm Juice: This fantastic liquid has Magnesium, which can keep the palm looking green. Palm trees love Magnesium, and it keeps the palm from being iron deficient. It helps increase moisture, nutrient uptake, stimulates root growth, and helps protect against stress. Apply this Super Palm Juice at least once every three months for spectacular results! This is an easy to apply liquid that can reach the roots fast! 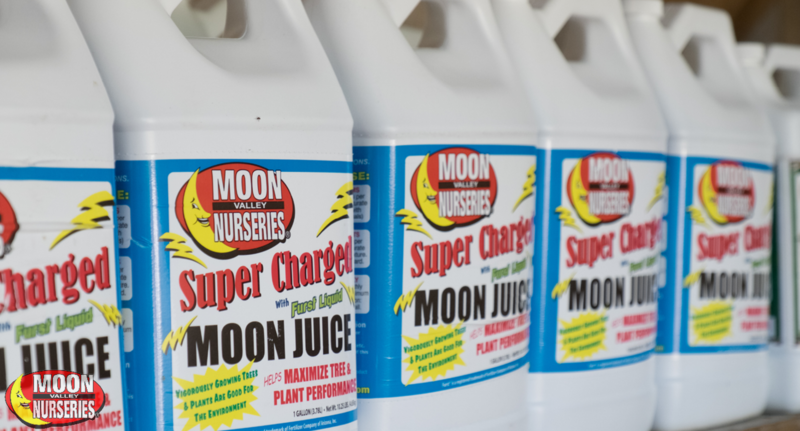 Moon Juice: This concentrated liquid contains the three most essential micro-nutrients that every tree and plant needs – Iron, Manganese, and Zinc. Palm trees love this juice because it can help them prevent and recover from the stresses caused by extreme heat. Moon Dust: This all-purpose fertilizer can be applied monthly for optimal results. 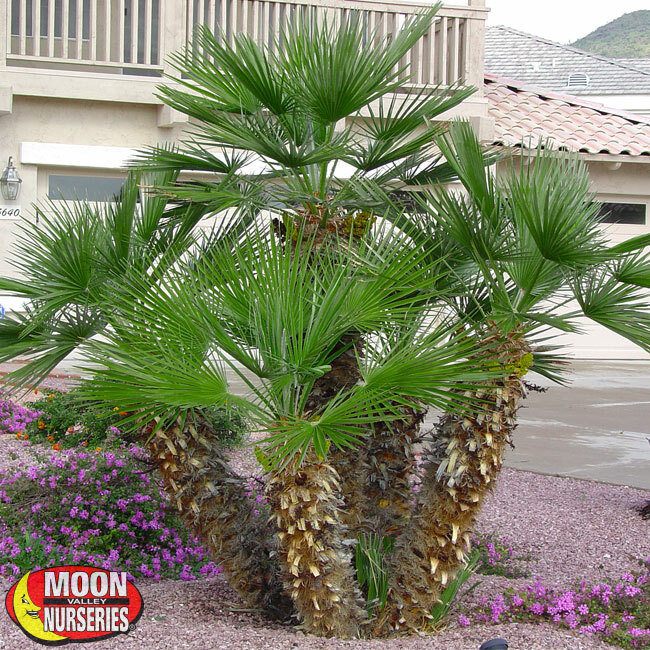 It has the essential micro and macronutrients palms need to thrive in our desert environment. Pruning and Trimming: Make sure you use sterilized equipment to prevent contamination and spreading disease. We recommend hiring a professional to do the job of trimming and pruning. Summertime in Arizona is dry and hot! Humans have adapted to live and thrive in the Phoenix heat. How about our beautiful palm trees? Water is the most crucial ingredient for the well-being of palm trees in the desert. Sure, many of the best palms in our area can handle the extreme temperatures, but when it comes to water, they will need more than what mother nature provides this time of the year. It’s never too hot to create a tropical paradise with palms. Moon Valley Nurseries is the grower of everything we sell so that they can be planted in our summer temperatures. That’s right. Our palm trees are grown in our local climate, so they have been acclimated to our local environment! Date Palms (Phoenix dactylifera): These elegant palms are native to the desert environment, so they thrive in Phoenix. If you are looking to add instant appeal and class to your property, you can do no wrong with these big marquee palms. Turn any landscape into a resort-style home! Line them up, and it can create plenty of shade, too. Our palms are certified disease-free and very drought hardy. Newly planted Date Palms should be watered every day for the first three days. After the first three days, allow the area of the trunk to dry completely in between watering applications. Piru Queen Palms (Syagarus romansoffiana): These palms are super hardy and can handle the Phoenix heat with ease! Create a spectacular tropical effect by planting in groups of two to five trees in varying heights. We like to plant them around water features, gazebos, and patios where they add to the tropical appeal. And, if you have a pool, they do not have an invasive root system, so feel free to plant near sidewalks and pool decks. We know that the temperatures are going to reach above 100 this summer, so water them about four to five times a week. Canary Island Palm (Phoenix canariensis): These natural beauties are prized for their elegant appearance. They are also called the Pineapple Palm because its crown resembles a pineapple. We sell Phoenix canariensis with diamond-shaped pattern trunks that add an instant and luxurious look to any landscape. These palms love the warm weather and thrive with full sun exposure. They are clean and very durable, too. As a bonus, they are very low maintenance palms, and we only sell certified disease-free Canary Island Date Palms. Plant them in groups for luxuriant tropical shade! Mediterranean Fan Palm (Chamaerops humilis): These are touted as being the hardiest of all palms. Plant them in the front yard as a focal point or poolside; they can create a tropical look to any landscape no matter where you plant them. People love them because they will rarely outgrow their space, and they are very easy to maintain. Trim them up to clear the trunk or let them grow into a shrubby form that can block unwanted views. Mexican Fan Palm (Washingtonia robusta): These classic resort-style palms have a single trunk that looks spectacular when skinned to give it a “cigar-cut” effect. Line them up along a driveway and create a grand and formal entrance. These are local favorites and one of the easiest palms to grow. They are drought tolerant once established and can adapt to a wide range of soils. 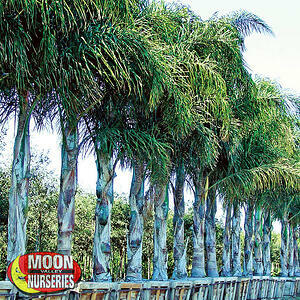 These palms are versatile and ideal for planting near the pool or as an accent palm. 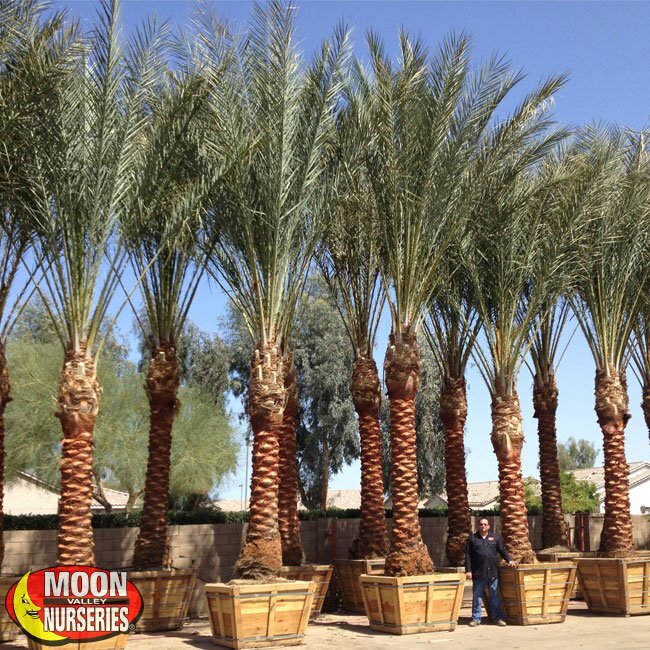 Moon Valley Nurseries sells certified disease-free palms that are ready to thrive in our local climate. 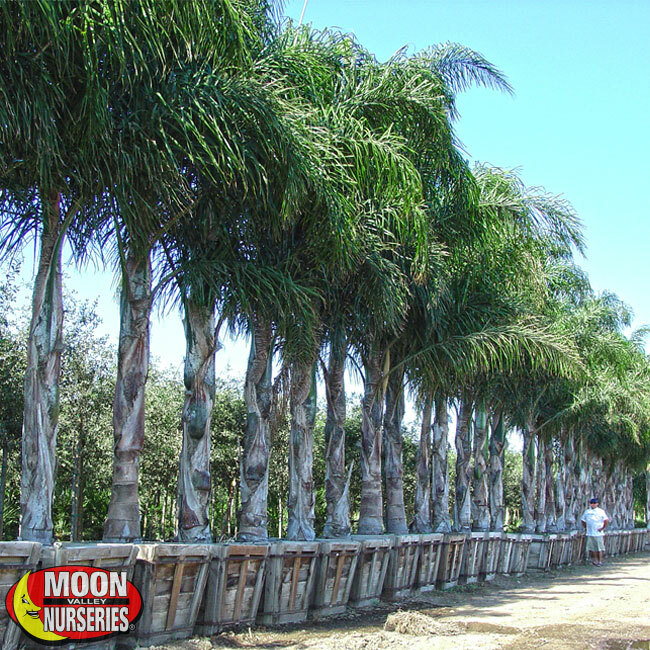 Allow us to help you create your dream landscape with the best-quality palms in the world! We value engineer our products, so you get the best-quality trees at the best price! It’s June, and here in Phoenix, it is often the hottest, driest, and sunniest month of the year. Yep, temperatures are soaring, and we can plan on triple-digit days for the next few months. Since it is going to get hot, preparing for the heat is essential. The good news is that with the proper care and preparedness, our landscape will take on the summer months with minimal stress. Below are some tips and tasks our nursery pros put together for the month of June. Keep reading to ensure a healthy and full landscape through the summer and into fall! Learn the Tips and Tricks from Our Nursery Pros! Watering: Though June is the driest month, we want to be sure not to overwater. We will want to water slowly and deeply, which is 5 or 6-inches deep. Deep watering allows the entire root system to become saturated. Long and slow applications are best so that the water can penetrate deep into the soil. Be sure to let the soil dry between watering. The best time to water is in the morning, between 4 am, and 8 am. Watering during these times reduces evaporation loss. Mulch: Applying mulch is an easy and effective way of keeping the soil moist all summer long. Apply mulch around the base of the tree. For best results, apply a 3 to 4-inch layer of mulch. Doing this can help keep the soil cool during the hot summer months and keep the soil warm during the cooler days. Lawn Care: Keep mowing your grass. A lawn will grow faster with the warmer weather. Try to mow the grass every 5 to 6 days, and do it when it is not so hot outside. June is the time to finish seeding Bermuda and warm-season grasses. Be sure to finish seeding by the end of June. Protect the Trunks of Trees: Trees can get sunburnt, and unlike people, sunscreen will not help. We recommend protecting the trunk of the tree with a protective tree wrap. 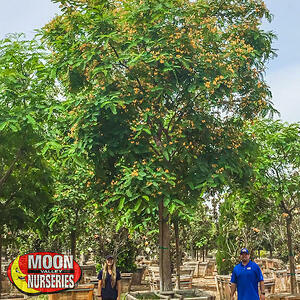 Fertilizing: Moon Valley Nurseries has developed fertilizers that can help trees and shrubs recover from any heat stress. Visit your nearest location and any of our nursery pros will be glad to assist you. Weeds: The heat won’t stop the weeds, so don’t let it prevent you from sticking to your weeding plan. Keep removing weeds and do it often. Most of all, be sure to pull weeds before the temperatures soar. We can use pre-emergent herbicides, and when applied, we can reduce the number of weeds that need to be pulled! Vegetable Garden: This is the time to start planting seeds for Armenian cucumbers, Cantaloupe, Muskmelon, and Sunflowers. Plant transplants such as sweet potatoes and be sure to water them both before and after they are planted. Pruning: DO NOT prune citrus and other sun-sensitive plants as this can expose them to sunburn. You can remove faded or dead flowers from your plants. Doing this can encourage new growth. It’s a good time to remove any unwanted or vigorous branches from trees. We grow everything in our local climate so that it is still a great time to plant certain trees and palms. 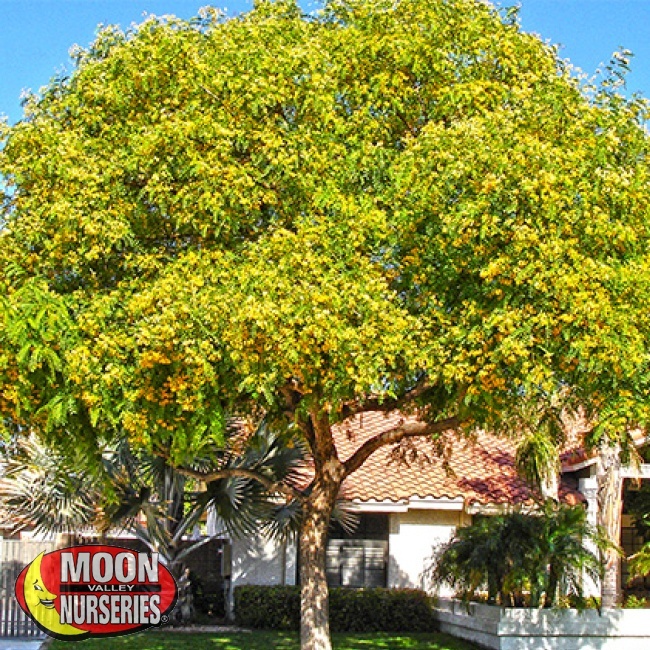 If you are looking for shade trees, buy specimen size trees so that you can enjoy the instant shade they provide. Summertime is pool time in Arizona. Create a tropical paradise and enjoy splashing in a pool surrounded by beautiful palm trees that can make you forget how hot it is beyond your backyard sanctuary. 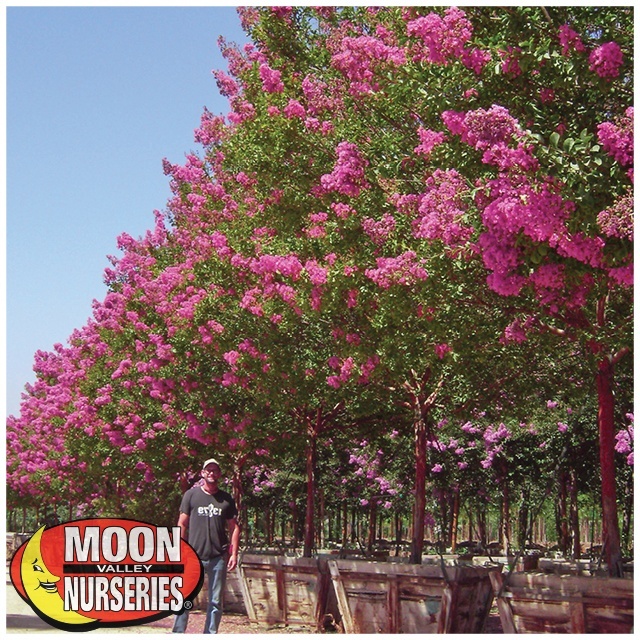 Crape Myrtle: We can add vibrant color to our arid environment with Crape Myrtle trees! These smaller ornamental trees put on a summertime show when the blooms start popping on the tree. Yep, right now, neighborhoods with Lagerstroemia are coming alive with flowers that range in color from pink to red, and white to purple. These trees love this time of year, and reward us with the beautiful colors that can make us feel good and make our yards look good, too! The show doesn’t stop. Crape Myrtle foliage will turn to a showy bright orange color in the fall. As a bonus, our varieties are mildew resistant. Look for Dynamite Red, Tuscarora, Natchez, Catawba, Muskogee, and Tuskegee varieties. Ficus: Shade, it’s what we tend to look for when we are outside during the blazing summer months. Thankfully, Ficus trees can come to the rescue. 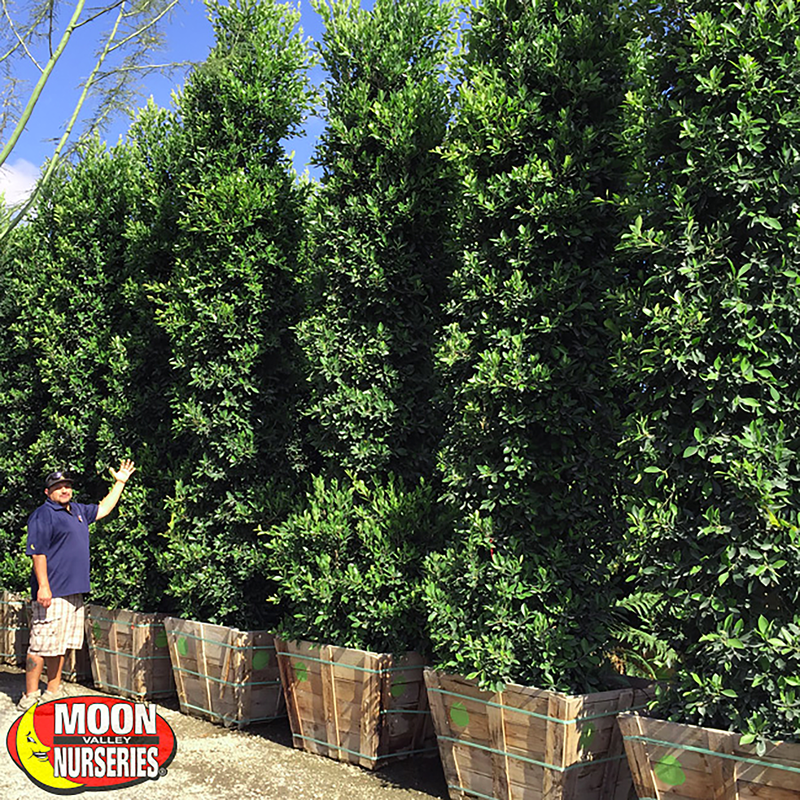 These evergreen trees feature dense foliage that can block the sunlight! Proper placement around the home can help to reduce the temperatures inside a home. They have a beautiful canopy that can provide plenty of shade to create a comfortable outdoor area. 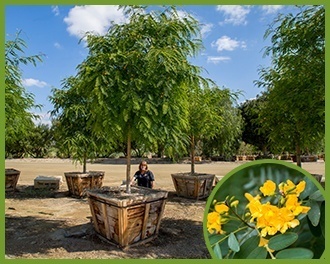 These fast-growing trees are available as a single trunk, multi-trunk, and we have hedge columns available that can create one of the best privacy screens you can find. Tipu: While we are on the subject of shade, we have to mention the Tipu tree. It is easy to see why these are some of the most popular trees we offer. They grow fast and have an upright growth pattern and a canopy that can create a large shade area. We love them in Phoenix because they can tolerate drought and can handle the hottest of summer days. It’s not just the shade coverage we love. Tipuana tipu puts on a show in late spring and into early summer when the golden blooms appear. 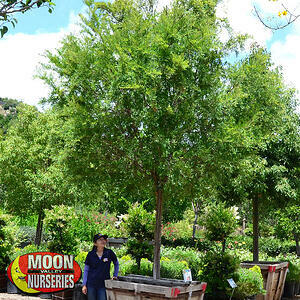 Vitex: These low-maintenance trees are the perfect size for any landscape. They are a favorite during this time of the year. From late spring and into the summer, unique purple blooms on long spikes appear, adding some much-needed color to our environment. Hummingbirds and butterflies love this tree, too. The trunk of the Agnus-castus (botanical name) tree should not be overlooked – the twisted and tangled growth pattern lends a grand appearance. Date Palm: Create a tropical backyard oasis just in time for summertime pool parties and relaxation! 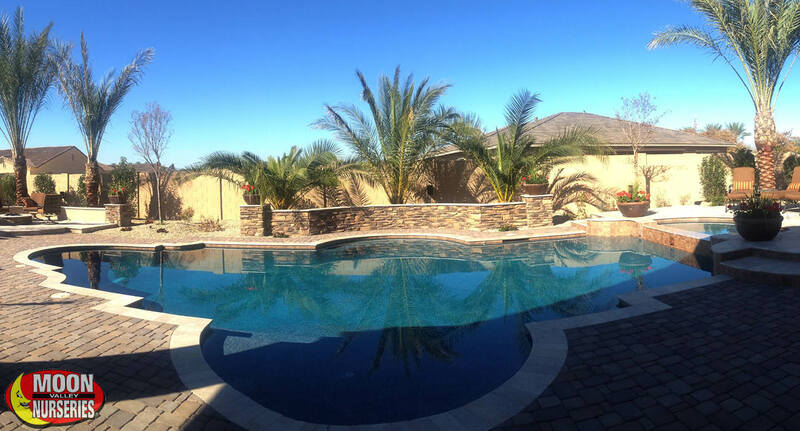 The Date palm is a beauty, and it is perfectly suited for the pool area. Their wide fronds can provide plenty of shade, and they are virtually litter-free. For the ultimate look, we recommend planting them in clusters of three to five, where they can create plenty of shade and privacy, too. Mediterranean Fan Palm: These show-stopping palms are front yard favorites and look fantastic around the pool area. We like to plant them in a location to fill in empty spots or between towering trees. People love how the trunks clump together, giving this palm a full, thick appearance.